Managing, scheduling, preparing, planning, and executing audits, reviewing CAPAs for acceptance, and tracking CAPAs to closure for medical device audits globally is a continuous challenge and many regulated companies must manage an increasingly challenging and demanding audit program without adequate resources. Outsource our highly experienced auditors today! The Quality of our auditing services are best in class meaning we provide more benefits and value-added services for less money! We provide high-caliber, FDA Compliance Specialists with 15+ years of regulated industry auditing experience; we provide a cost-effective, fixed price audit for each audit we support; our fixed price audit includes: pre-audit preparation; audit planning; travel time (U.S. only); the audit itself; daily audit debriefs; the final audit report with one review cycle; and we assign a dedicated U.S. based audit administrator for every audit we support. FREE FDA Compliance Training $10,000 Value! 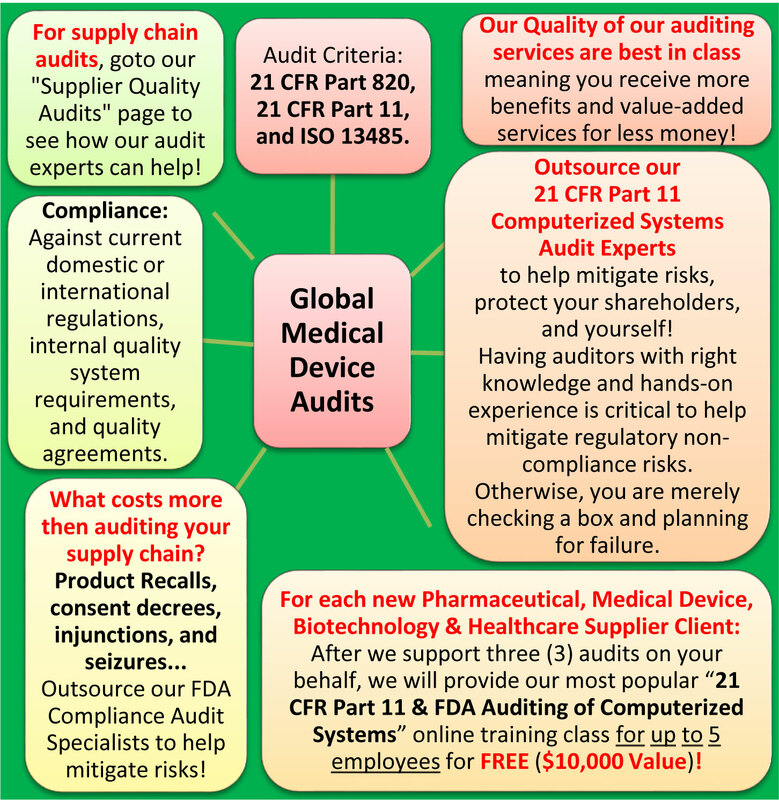 For each new Pharmaceutical, Medical Device, Biotechnology, and Healthcare Supplier client - After we support three (3) audits on your behalf, we will provide our most popular “21 CFR Part 11 & FDA Auditing of Computerized Systems” online training class for up to 5 employees for FREE ($10,000 value)!